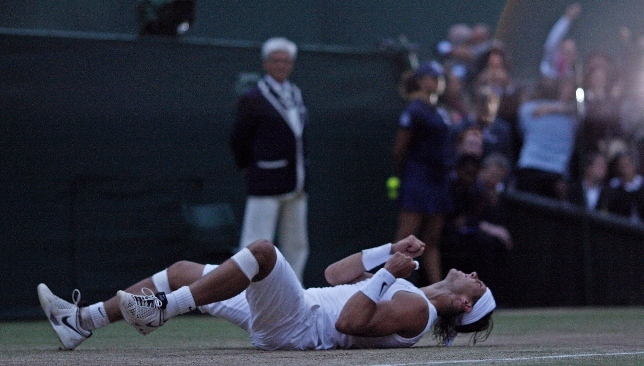 Thriller: Rafael Nadal celebrates his 2008 triumph over Roger Federer. The debate over whether it is time to introduce fifth-set tie-breakers in Grand Slam events – bar the US Open which already has one in place – has hotted up since Kevin Anderson and John Isner’s serve-athon in the Wimbledon semi-finals. The two giants pushed each other to 26-24 in the final set, in a match that lasted six hours and 36 minutes and became the fourth-longest duel of all time. Rafal Nadal and Novak Djokovic then followed that up with their own fifth-set epic, with the Serb coming through 10-8 in the decider. The spectacle of a long climax to a match is intense and enthralling, but the efforts of such a long affair leave players little time to recover for the next round – in this case it being Sunday’s SW19 final. Lasting seven hours and two minutes, the match was the longest in the competition’s history and is the second-lengthiest of all time. Held on indoor courts in Geneva, the win helped the Czechs to a 3-2 success overall as the team went on to win back-to-back titles. Following this, a fifth set tie-break was introduced in 2016. Czech pair Tomas Berdych (L) and Lukas Rosol pictured after the epic. ‘The endless match’ divides opinion and perhaps created this debate in the first instance. It took the two big-servers 11 hours, five minutes to complete their epic, over a span of three days in a contest which leads the longest match record by some distance. 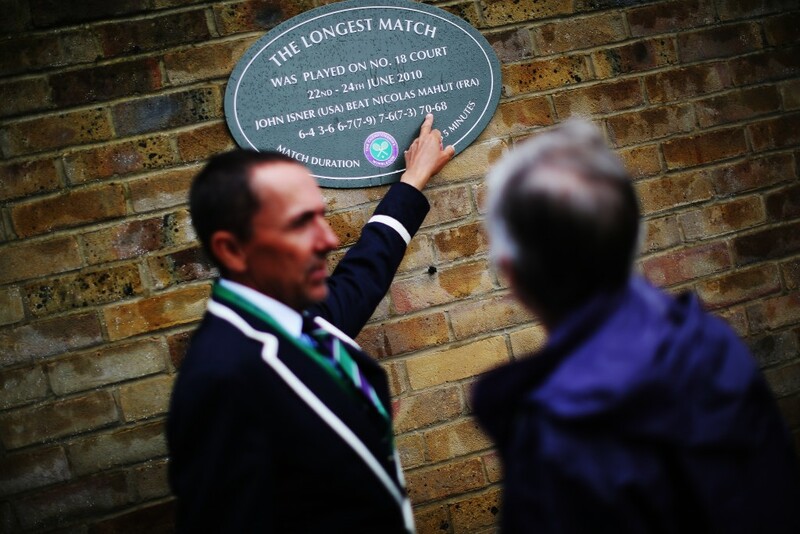 The final set, which ended 70-68, took an incredible 491 minutes to complete out on Court No.18 at Wimbledon – where a plaque sits beside the court in reference to an occasion we will probably never see again. Each player hit more than 100 aces and the match’s entire length exceeded that of Serena Williams’ time spent on court in her run to the title in 2009. What a match: The Isner-Mahut clash was one of a kind. If there was ever a tennis match where a draw would have been the fairest result, then this was it. Neither player deserved to lose but Federer found a way to win, breaking Roddick in the 30th and final game of the fifth set to secure his sixth SW19 crown. The win for the Swiss was of extra significance as he surpassed Pete Sampras’s haul of 14 major titles to claim his 15th, in front of the watching American on Centre Court. The defeat was a bitter pill to swallow for Roddick given it was his third final loss at Wimbledon to Federer and he became the only player in history to have lost a final having only had their serve broken once. 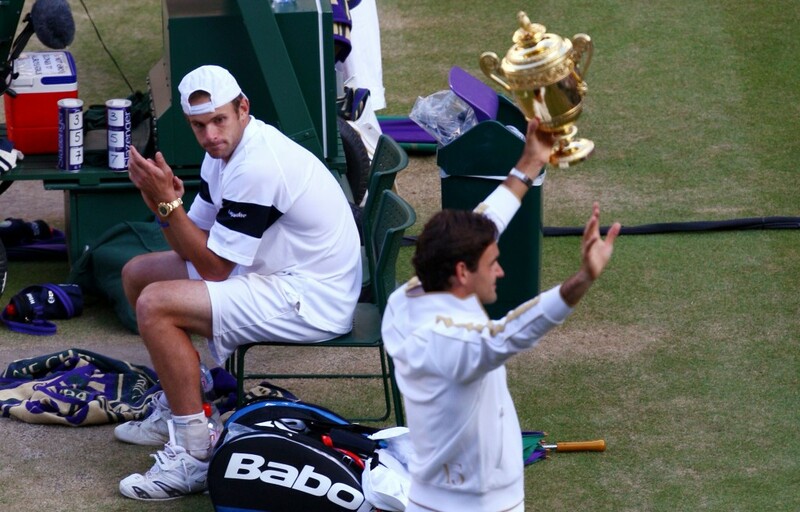 Agonizing: Roddick was so close to the Wimbledon title. Billed as the greatest match in the history of the game, the Spaniard broke Federer’s run of five-consecutive Wimbledon titles in a marathon encounter, which lasted for four hours and 48 minutes, and was disrupted by two lengthy rain delays and completed in near darkness. Don’t forget, back in 2008, there was no roof at the iconic Centre Court venue. But organisers pushed for the match to finish on Sunday. Although the Nadal-Federer showdown didn’t stretch long in terms of game in the fifth, proceedings finished at 21:15 local time and only added to the drama as Nadal collapsed on the floor in celebration as Federer struck a cross-court forehand into the net. 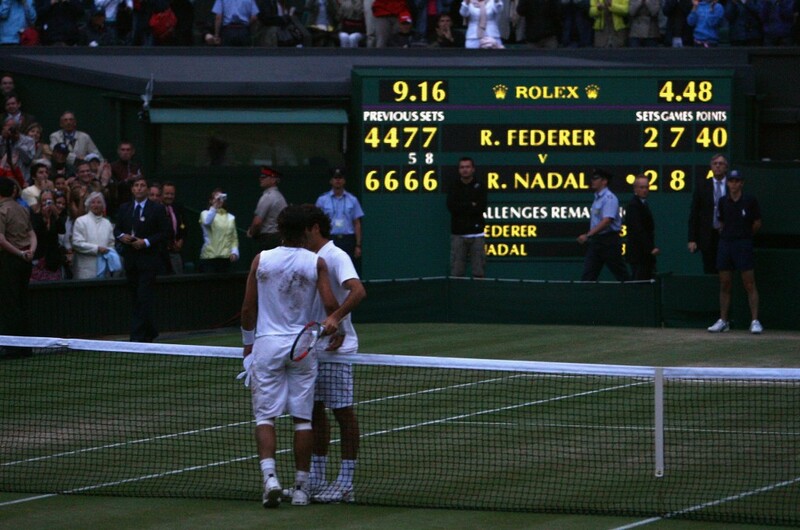 Dramatic match: Nadal and Federer embrace at the net. Played before the Davis Cup adopted a tie-break in all sets, American legend McEnroe downed Swede Wilander in the seventh-longest match of all time. Three out of five sets went sizaeable distances, not just the decider, as McEnroe finally triumphed after six hours and 22 minutes of play. The match is also remembered for a clash of styles, with McEnroe, the bad boy of tennis, employing his famed serve-and-volley tactics while Wilander was known as one of the game’s quickest players ever as well as best returners. 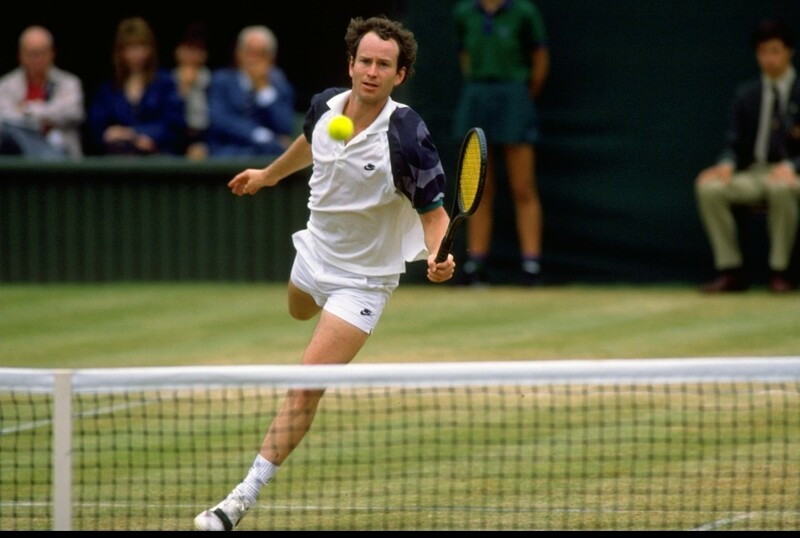 Legend of the game: John McEnroe.